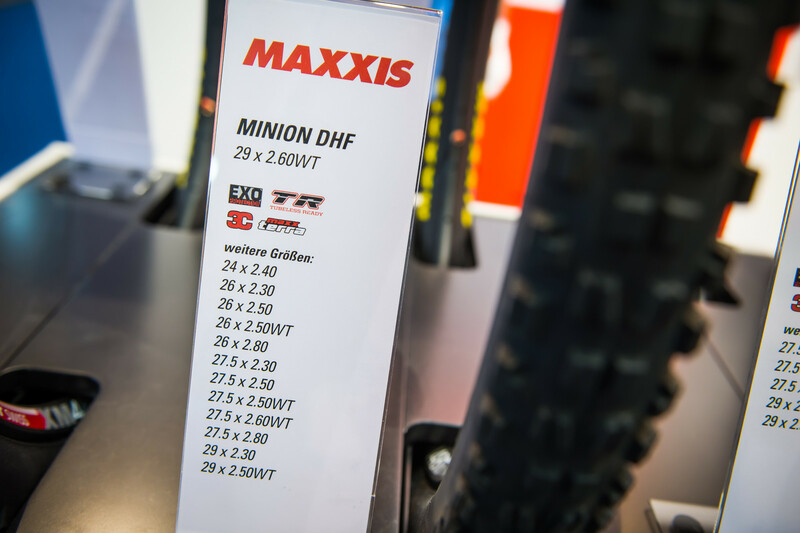 A tougher casing that slots in between EXO and Double Down and new rear XC tire for 29ers only highlight the Maxxis line-up at Eurobike. If you're a rider who suffers above average amounts of punctures or sidewall tears, Maxxis has good news for you. 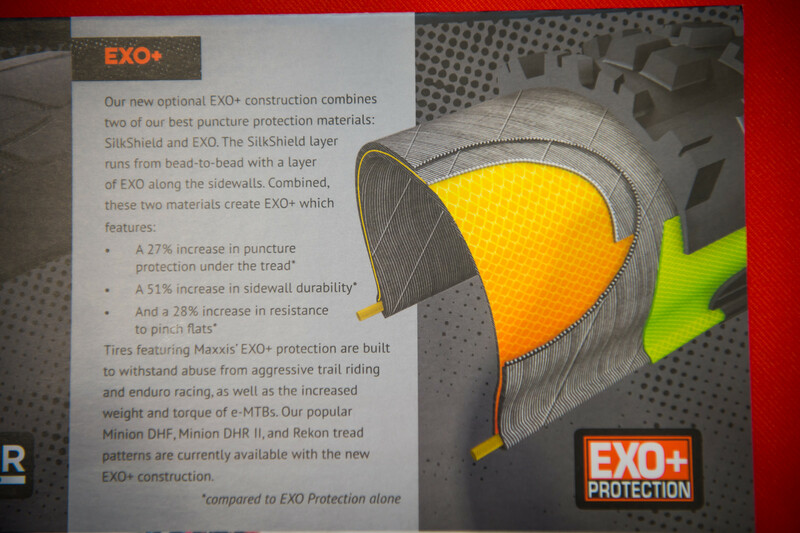 The arrival of EXO+ tire casing introduces a silk-shield layer which runs within the casing, from bead to bead, providing what is quoted as a 27% increase in puncture protection, a 51% increase in sidewall durability, as well as a 28% increased resistance to pinch flats. EXO+ casing adds about 30 to 40grams to a given tire size and fills a gap between the existing EXO and Double Down casings. Because this EXO technology is designed for more aggressive riding styles, it will initially show up on the Minion DHF, DHR II, and Rekon tread patterns and likely only in the WT (Wide Trail) sizes. Expect availability of EXO+ equipped tires around the end of the year. 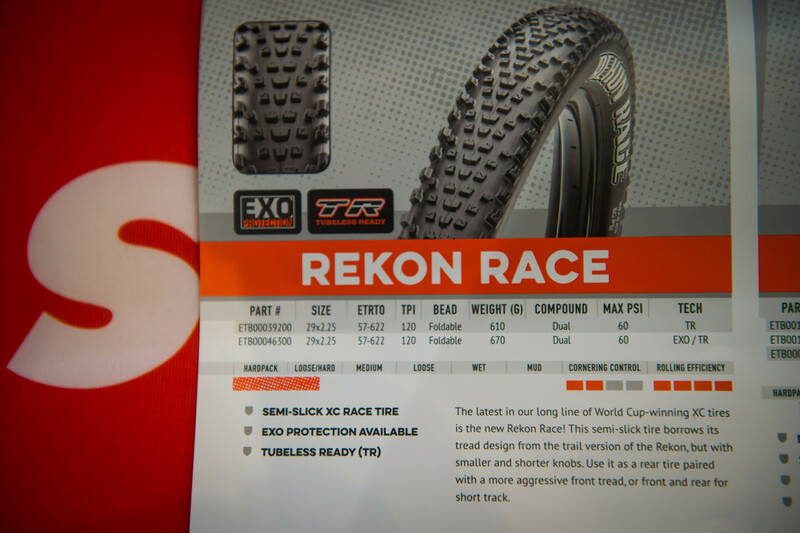 An all new Rekon Race tire has been introduced as a faster rolling version of the Rekon, intended specifically for use in the rear. This 29-inch-only tire features a 2.25-inch width and weighs in at 610 grams, available with EXO protection. Other than that, we haven’t seen any new treads or tire designs. 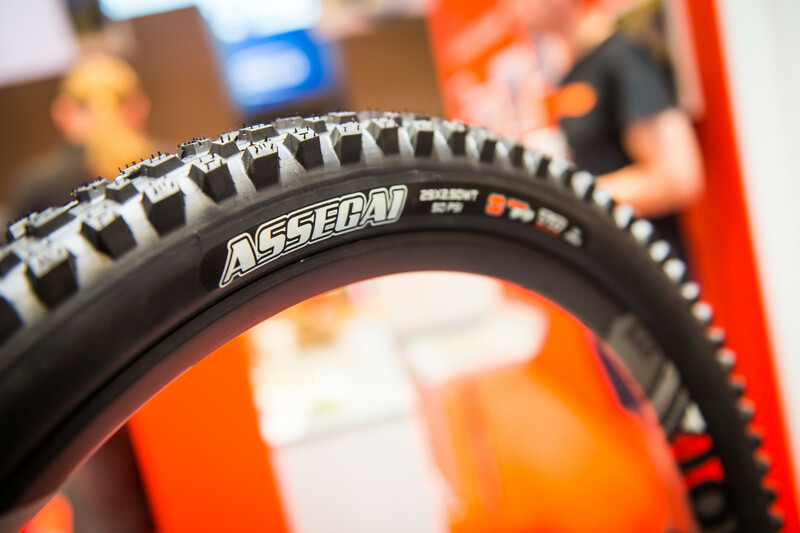 Of course Minnaar’s Assegai tire was on proud display. And don't forget. 26 ain't dead yet. I don't get punctures, but do ding up my rear rim real good. I'm interested in a DD rear for sidewall support and rim protection. Unclear if the EXO+ is in between EXO and DD on sidewall stiffness. Also thinking EXO plus Huck Norris will be a better fit for me anyway maybe? Cushcore will do a better job than Huck Norris in protecting your rim from dents and dings. Its sits tight on the rim overlapping rim width creating protection that is in place even if you do flat. Huck Norris while wide enough moves around as well as has weak points as its is not a complete piece that protects without gaps in product due to being constructed in sections. Cushcore will help much better with your issue than Huck Norris or Exo+ or DD casing. Hey Allen, DD uses two plies of casing material so it will have stiffer sidewalls than EXO+. In terms of stiffness and protection EXO+ slots in between EXO and DD. @Maxxis Bicycle, no plans for an Aggressor EXO+ anytime soon? Seems like an awesome option for those of us that don't flat enough to justify dealing with the weight of a DD. The Agressor is on the short list for the EXO+ treatment. We wanted to get it out in our treads with broader applications first.